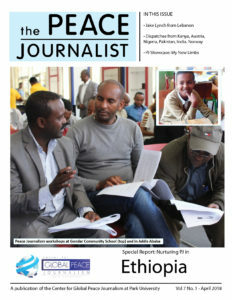 If you are a writer, consider submitting to The Peace Journalist. The deadline for the next submission is 9/7/18. I’m writing with my semi-annual call for papers for the Peace Journalist magazine. We seek submissions on peace journalism initiatives, research, etc. However, we do not seek general submissions about peace projects, unless they entail a media angle. Submissions should be 500-1500 words, and sent to me at this address by Sept. 7. Photos are welcome. I have attached a copy of our April edition. For more about the magazine, and our Center for Global Peace Journalism, please see www.park.edu/peacecenter. Here is a link to the April edition.